As soon as the sky starts to darken, look west into the fading glare of the sunset to find Mercury, the smallest of the visible planets. It can be tricky to spot but binoculars can help, as long as the Sun has gone from the sky. Venus has vanished (rather quickly) from our evening skies as it overtook Earth in its faster orbit and now appears on the other side of the Sun, so we will see it just before sunrise each morning, getting higher in the sky as the month goes on. Mars is just visible above Mercury but you will need the sky to have become properly dark, by which time it will be getting close to the horizon. Near the end of the month, on the 28th, Mars lies between the Pleiades and the brightest star of Taurus, Aldebaran, with a thin crescent Moon close by to present what should be a lovely tableau. Now here’s a thing: Mars is almost exactly twice the size of our Moon. Later in the month, the Earth trundles through the dust trail left by comet Thatcher. This produces a meteor shower, the Lyrids, and if the weather has warmed up a bit, it is a good one to get out and observe. It is noted as one of the best showers and with the Moon out of the way, it could put on a good show. In fact, in 1803 it was described as resembling a shower of sky rockets but, of course, there is no guarantee of a repeat performance this year. It peaks during the night of the 22nd and they can appear anywhere in the sky but you may have to spend some time observing. Now here’s another thing: the largest of the objects creating these trails across the sky is no bigger than a grain of sand and most are nowhere near that big. Big is the International Space Station, and this is visible at some time most days of the month. You need to visit http://www.heavens-above.com for exact times. On the 10th, a Soyuz will undock from the station to return the three members of Expedition 50 to Earth. Because they need to land in Kazakhstan, we are unlikely to see it in Alvechurch. 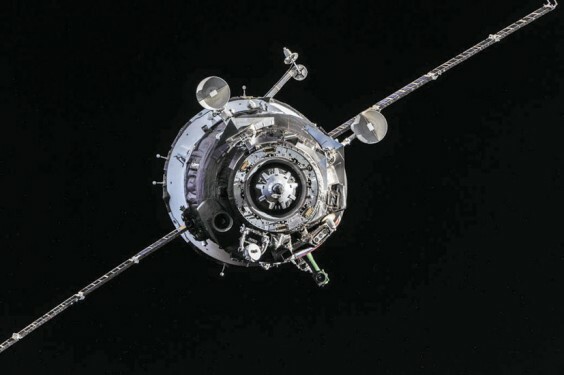 Don’t despair, though, because on the 20th, another Soyuz launches to take members of Expedition 51 to the station (only two of them this time). We do have a better chance of seeing this so keep checking the website. Now here’s yet another thing. The Soyuz craft consists of three modules – a service module, a crew module and a docking module at the front. This means that you can’t see where you are going from the driving seat, a bit like driving a van from the load space at the back. So, to facilitate this, each Soyuz is equipped with a periscope. You can see it in the NASA picture.